Marcus Peters is a “buyer beware” kind of prospect. Before we take a look at the tape, let it be known that Peters comes with a fair amount of baggage. Here is a timeline of the second team All-Pac 12 star cornerback’s troubles that will send red flags up throughout the scouting process. Discuss your thoughts on this potential Ravens draft prospect on our message board. 2011- Failed drug test (marijuana) during his redshirt year. Dec. 2013 – Suspended for the first quarter of the Fight Hunger Bowl for turning in a class assignment late. Followed up by a four-week ban from off-season training with the team. Sept. 2014 – Head butting an Eastern Washington receiver resulting in a 15-yard penalty. After reprimand on the sideline he throws a tantrum, tossing his helmet, gloves, screaming at the coaches, and would be suspended for the following game versus Illinois. Sept. 2014 – Suspended for the first two series of a game versus Stanford for being late to a team meeting. Nov. 5, 2014 – Dismissed from the program after an altercation during practice with coaches. Allegedly, someone spotted him choking an assistant coach which was the final straw. But the coaching staff squashed that rumor immediately, reporting that there was no “physical altercation” that took place. The big question is, and all ways is, are you good enough to make coaches put up with the Immaturity. If Marcus Peters wasn’t one of the best cornerbacks in the country, would UW Head Coach, Chris Petersen, have let him have one incident after another before dismissing him from the program? If Washington was playing Oregon instead Illinois following Marcus Peters hissy fit, would he still have been suspended for the whole game? How good are you, really? Where do teams draw the line and say “that’s too much”? The Ravens terminated the contract of Terrence Cody because he owned an alligator (illegal) and the gator attacked a dog because he wasn’t feeding his starving illegal alligator. If Joe Flacco did this…what happens? Do they terminate his contract and take on the $36.4M in dead money against the cap over the next two years? Not a chance. Marcus Peters clashed with UW coaches after former Head Coach, Steve Sarkisian left for USC, and Chris Petersen was brought in from Bosie State. His staff, and Peters never saw eye to eye. So when Marcus Peters meets his new head coach and group of assistant coaches, what will make things different? What will make Peters grow up? Will giving an immature player a boat load of money only make his ego and immaturity level grow? Can you tame that? Needless to say, Marcus Peters will be grilled, scrutinized by coaches and general managers at the meetings and pro day. Coaches will want to be absolutely sure about what they are getting into. In the Ravens case, red flags, don’t often mean much. They have taken on men with checkered pasts before, feeling that sometimes a second chance, or someone telling you they believe in you, rather than a lecture of how bad you have been, is what uplifts some of these guys to turn their character around. 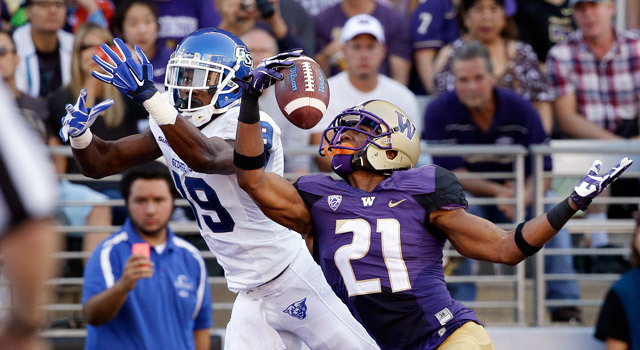 Marcus Peters had 11 INTs, 35 passes defensed, and made 129 tackles in his three years at UW. Lets go to the tape. In this game against Hawaii, Peters showed good closing speed, and the ability to break up the pass. Really nice job of jarring the ball loose, where as some guys will just give a good shove, or shoulder, and hope it comes out. Here is a gme versus Stanford from 2013, and this is Peters highlight filled game. Even one negetive play he had, wasn’t all that bad. But first the good. A beauty of an INT, going up and getting the football like a WR does. Too bad his teammate was hit by friendly fire. On kick return, it’s usually the kicker who is the last man a returner has to beat. Not here. Check out the closing speed. That was some of the good, now a little of the bad. Back to the Hawaii game, Peters is caught looking at the QB. You want to look for the ball, yes. But he had no idea his receiver broke off the route. If the QB didn’t throw it right away, Peters might still be streaking down the sideline. Too big a cushion hear against Eastern Washington. Also staring in the backfield too long. Came back physical to break it up, but this a TD in the NFL, or against receivers from places than Eastern Washington. Back to the Stanford game. Ty Montgomery (Projected mid round NFL draft pick) gets the best of Peters on the deep ball. Yeah, its a TD, but Peters coverage still wasn’t bad. Just a perfect throw which is what it had to be. Summary: Let’s go back to a previous question. Are you good enough for teams to take on the baggage? Marcus Peters is good. And a team will definitely take on the baggage, and may be able to aid him in growing up. He’s not a lost cause, or wasted talent like Josh Gordon has become. Is it bad if you have to say “at least he hasn’t been arrested.”? Attitude isn’t as nearly as bad as being a habitual law breaker. However, there are some weaknesses in his game. I don’t see him being a shutdown corner from day one. But the potential is there. One thing is for sure, there isn’t any tape out there where quarterbacks pick on Peters. Being a passing league, and with so many rules favoring the receivers, if you can get your hands on a good CB, you do it. Peters is a first round talent that teams may pass on. He could be a guy the Ravens value very high, and could have the option to take at #26 as possibly best player available on their board, and the bonus of filling a major need.